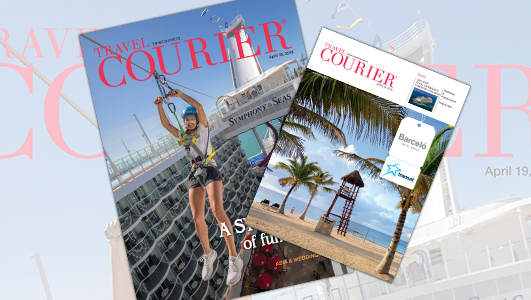 If bigger is better – and many certainly think that’s the case – then Royal Caribbean International continues to be tops at sea with the recent launch of Symphony of the Seas, the world’s largest passenger cruise ship, reports assistant editor, Greg Coates in this week’s digital edition of Travel Courier. The 25th ship in Royal Caribbean’s fleet, the 5,518-passenger (at double occupancy) Symphony of the Seas is 228,081 gross registered tons, measures 238 feet tall and spans 1,188 feet long. It has 18 decks and 2,759 staterooms. Like its sister ship, Harmony of the Seas, the newest Oasis Class vessel includes seven distinctive neighbourhoods – Central Park, Boardwalk, Royal Promenade, Pool & Sports Zone, Vitality at Sea Spa & Fitness Center, Entertainment Place and Youth Zone. Other returning favourites include the Ultimate Abyss, the tallest slide at sea starting at Deck 16 and twisting its way down to Deck 6, The Perfect Storm, Flowrider, Escape Room, Wonderland and the AquaTheater. New features include Hooked, Sugar Beach, Playmakers, El Loco Fresh, Glow-in-the-dark Laser Tag and the two-storey Ultimate Family Suite. Symphony is slightly bigger than Harmony, making it the new world’s largest passenger cruise ship.